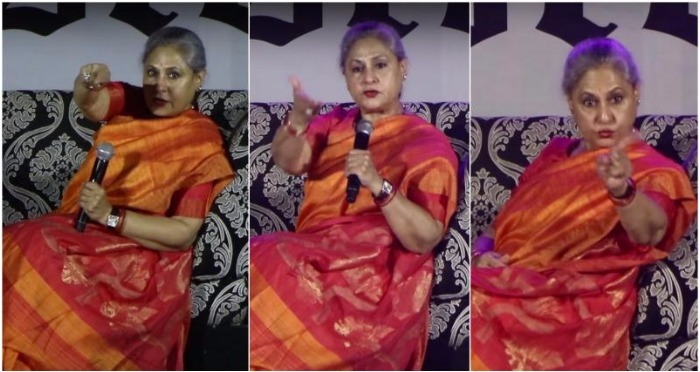 Jaya Bachchan does not like journalists and that is quite evident by her nature towards the latter. But to be offended by cameras flashing in the face, that is quite a shocker, given that being a celebrity almost comes at this cost, whether one likes it or not. The anger of yesteryear actress is quite a notorious one, whether for journalists, or even in parliament, and to the misfortune of some students of this elite college where Jaya ji had visited. It so happened that Mrs. Bachchan had gone to attend a college festival, where, while speaking, she caught a few students snapping her pictures, and apparently lost it, saying that they can take pictures first, she will talk later. In fact, Jaya’s sternness led to her being compared to a strict school teacher! Maybe, the actress is of the era when people asked before clicking a picture, and there were no smartphones, but we do feel that being a celeb, she should be a tad calmer, as far as these things are concerned. Anyway, we hope Jaya Bachchan sorts these issues soon. Previous : Sakshi Malik and P.V.Sindhu Win Medals and Hearts of Cricketers, Celebs and Commoners Alike!